It is a dark reimagining of every conspiracy theory that ever lived. It is the JFK assassination, Area 51, the moon landing, the surveillance state. It is a French spy posing as Abraham Lincoln, it is a video game designed by the CIA, it is “Suicide Mickey.” It is Adolf Hitler and it is Elvis Presley. In this short story collection, today’s top fiction authors pull back the curtain on the biggest conspiracies of all time. Who really killed JFK? What happened in Roswell, New Mexico? Is Elvis still alive? 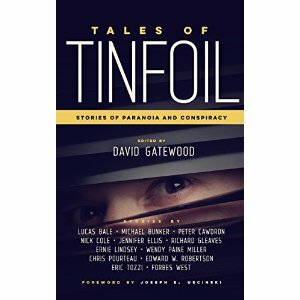 With stories that run the gamut from touching to thrilling to utterly deranged, Tinfoil will take you on a tour of paranoia you won’t soon forget. Twelve short stories, twelve conspiracy theories, twelve twisted rabbit holes. I decided the easiest way to come back from my vacation was to read some short stories to get back in the flow. Unlike some of the previous short story collections I have reviewed, this one was more of a mixed bag for me. There was one story that kept my attention so that I could have read an entire book about it, a couple of others that I found pretty interesting and some that just fell flat in my opinion. I’m going to go through the stories I enjoyed the most and leave you to explore the rest on your own. I’m not usually much for conspiracy theories, but I decided to put that aside and just enjoy this book as a collection of stories. Mr. Gleaves did a good job with his main character. I felt the main character’s hopelessness and despondency over what others considered to be him wasting his life for many years. This story was an interesting look at people who become so obsessed with a topic or trying to solve a mystery that it takes over their lives. It was also a story that weighed the needs of many to have an answer over the life of one man. On the whole this was an interesting story and I enjoyed the ending. Unfortunately, with short stories and especially those in this collection, it is difficult to talk about the shorter stories without giving too much away. Our main character, Bo, is the criminal sort and finds himself in some unusual circumstances and faced with an equally unusual task. Though the item he is asked to find seems innocuous at first thought, it turns out to be a more far-reaching problem than he could possibly believe. Plenty of twists and turns in this story to keep things interesting. I loved this story. The story is told from two perspectives, a man from the U.S. and an old Chukchi hunter. This story is about so much more than the conspiracy theory that shapes it. The characters are vibrant and real. This is a story of different cultures, language barriers, fear, compassion and bonding together to help one another even when we don’t understand. I could have read an entire book based upon the characters that Mr. Bale created. This was a beautiful story. I read a lot of stories, but this one truly touched my heart. The language barrier between the characters led to misunderstandings and somewhat harsh judgments, but it was interesting to see the characters move toward understanding and having compassion for one another as the story progressed. I’d add this story to the must read list and am looking forward to checking out some of Mr. Bale’s other work. That’s a Wrap from the Sea of Tranquility was definitely an interesting take on why the original moon landing would be faked. It’s very much got that feel of the movie, Wag the Dog, if any of you have seen that. I enjoyed the story, it was written well and the reason for the faked moon landing was handled pretty well. All things considered this was a good story and I’d be interested in reading other things from this author given what I’ve seen thus far. It was definitely a different take on the reasoning behind why we would fake a moon landing. The French Deception took an original turn and created a new conspiracy theory for Abe Lincoln. This is a story I could truly ruin by saying too much. Let’s just say that things aren’t quite the way you would expect with Abe and that Booth is only an afterthought of this story. The conspiracy here is so much bigger than just assassination. A pretty good story and I definitely liked the direction it took from an entertainment perspective. This was a cute story. Dolores, our main character’s grandfather’s girlfriend, is an avid Elvis fan and convinced that he is still alive. This belief leads Dolores and Anna to the Bermuda Triangle to investigate Dolores’ leads. I had never investigated it, but there seems to be quite a bit of complexity to the Elvis theories. In addition to their search for Elvis, there is some soul-searching and a little romance for Anna. Altogether a pretty good story and I was interested by some of the real life tidbits that I learned along the way. This collection is full of interesting stories and, once again, I found some new authors to explore, which is really my favorite part of reading short fiction. I’ve read several anthologies edited by David Gatewood and they have all been pretty good. As I stated earlier, I’ve never been one to be interested in most conspiracy theories, but very much enjoyed the fictional stories presented in this collection. Happy reading.